"Stale data" is a conversation that is being had in many organizations today. A natural byproduct of our information in the big data era. And, while decision makers need access to real-time data to make business decisions, stale data still needs to be maintained and stored for a variety of reasons - from spotting trends and reviewing historical progress, to long-term storage archiving for legal and regulatory compliance. VMblog: Bob, when thinking about this "stale data," is this something you and your organization are hearing a lot from customers? Bob Spurzem: Absolutely! This is a very hot topic right now. In fact, I recently had the opportunity to speak with Gartner's Alan Dayley, Research Director. The primary focus of much of our conversation was the storage and management of "stale" data. Alan shared, "Every customer I speak with has a potential problem with managing stale data." VMblog: Agreed. To take a step back, in speaking with enterprise IT and business customers, how are they classifying stale data? Spurzem: The folks we are speaking with classify stale data as consisting of end user files that for various reasons have become less valuable (i.e., at the end of a project or simply due to age). Stale data can be found virtually everywhere -- on user desktops, file shares, and just about anywhere else files are stored. However, many of these files can remain, or may become again in the future, valuable to the organization because of the intellectual property or other sensitive data they contain, and so on. So, instead of being shredded, the challenge is now how best to store and manage? Successful management of stale data needs to be dictated by how an organization adapts to the changing value of the data over time. At time of creation, files are user-centric and are best located as close to the user as possible. As tasks/projects reach completion, files oftentimes become less valuable to the end user. At the same time, these files can remain valuable to the organization for reasons such as maintaining a historical record of business, legal preparedness and regulations compliance. VMblog: Can you provide an example? VMblog: So, what's the answer? Spurzem: One suggestion is to "quarantine" this stale data until its status can be safely determined. In this example, quarantine refers to low cost, secure storage of data in a "protected" location. Although, if necessary, the long-term storage needs to also offer the ability of appropriate disposal. Public clouds, such as the Microsoft Cloud, offer an ideal solution to store and manage unlimited amounts of data easily, securely and economically. But, the move to the public cloud can have speed bumps. So first, users need to seek a solution that enables fast, seamless and protected migration to the cloud platform. Next, the solution should provide a managed "quarantine" repository to protect data and manage access, search and disposition automatically, based on user-defined metrics. Last but definitely not least, the solution should enable stale data to rest secure in the public cloud (i.e., Microsoft or others), yet remain easily accessible for search, business purposes, legal discovery and compliance. 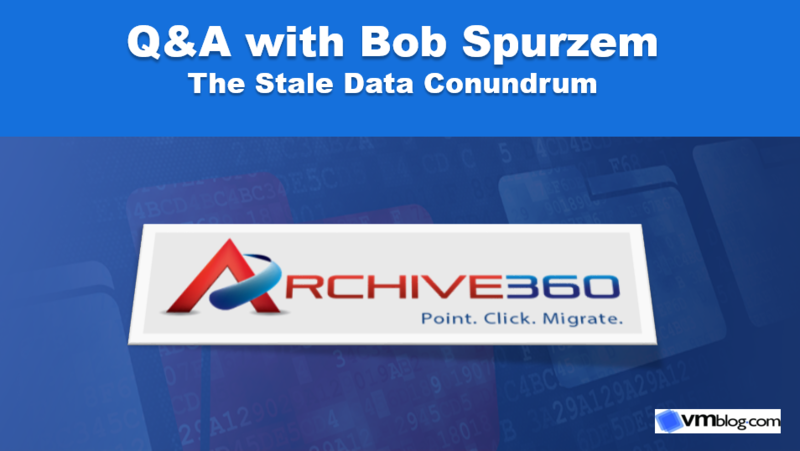 Once again, thanks to Bob Spurzem, Director of Product Marketing at Archive360 for taking time out to speak with VMblog.com.